There hasn't been much snow this winter on Mackinac Island, in the Upper Peninsula, in Mackinaw City or near Harbor Springs and Petoskey. However, people are still enjoying winter fun on the ski slopes thanks to Nubs Nob being so on top of making snow. Even though temperatures have been cold, the Ice Bridge has been closed due to open water showing in areas of the Straits. There has been sadness on the Island because a local resident has been missing for three weeks. It is feared that he may have gone through the ice on his snowmobile while trying to get to St. Ignace late one night. He and his family are in our prayers. The last week in February was quite windy...making people wonder if the March winds are arriving and bringing an early spring. Mr. and Mrs. James Dunnigan bought it in the late 1940's being only the 4th owners. 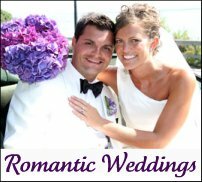 Over the years, countless friends and family have gathered at this beautiful home to enjoy friendship, laughter, great Irish ballads, Mackinac Island memories, countless jigsaw puzzles, and wonderful dinners and parties. Marcia's mother, Barbara, has been busy compiling over 70 years of recipes these gatherings have produced. What's more appropriate than having the first recipe's main ingredient being northern Michigan whitefish! 8-oz cream cheese; 1/2 pound of smoked whitefish - skinned, boned and flaked; 2 Tbsp green onions, finely chopped; 1 Tbsp fresh dill, chopped; 1 tsp lemon juice; 1/4 tsp freshly ground pepper. Mix all until well blended. Cover, refrigerate (about 3 hours). Serve with matzo. Garnish with quartered lemon, lime slices, and fresh dill. To read more about the Donnybrook Mackinac Island Cookbook click here. If you love anything about the Titanic; and if you love everything about the Grand Hotel...then reserve your room at the Grand Hotel's Titanic weekend. You will go back in time and live out the last few days of the doomed H.M.S.Titanic. 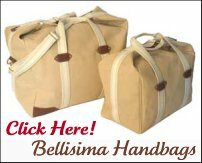 Guests are invited to dress in period fashion as first class passengers. On the last evening you will dine on the same last meal served on the Titanic. You will also find out if you were a survivor...but rooms are few on the Titanic and at the Grand Hotel so reserve your room now! Mackinaw City is the gateway to magical Mackinac Island. 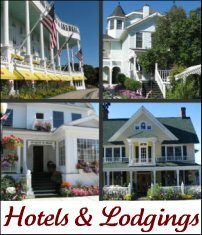 It's also one of the most popular family vacation spots in northern Michigan. 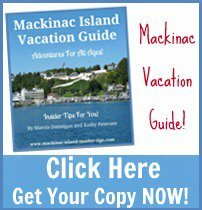 Read an article that Marcia and Kathy just got published about this fantastic vacation spot called Mackinaw City by clicking here. #4) Shop Owners Are Looking for Summer Employees! Great work and great memories occur when you find a summer job on Mackinac Island. If you know someone who is looking for an incredible summer work experience, now is the time to act. 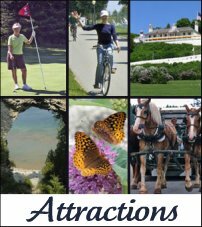 Learn about the different opportunities by reading Mackinac Island Summer Job Opportunities. 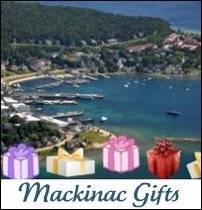 We hope you enjoyed this issue of our Mackinac Updates e-zine. We'll keep looking for Updates to send to everyone in our next Mackinac Update e-zine in March! If you have any events or news you would like us to share just Contact Us.